Some movies are entertaining. This is not one of them. Listen, I can forgive many things when it comes to this franchise because I love the concept so much. The second and third installments are a decently fun time at the movies (let’s not talk about the first), and I’ll always be a staunch defender who wishes they went even further in ridiculousness. But this? This is difficult to forgive. Aside from a few striking images and a rousing action set piece at the end, nothing about this remotely resembles a movie of even average quality. 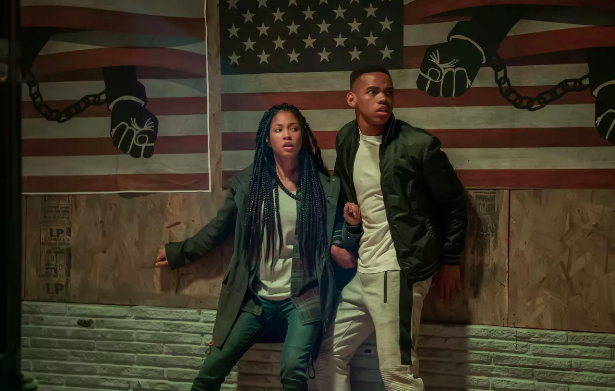 The characters aren’t just bland; they’re excruciatingly painful to watch because James DeMonaco decided one day while reading the news that he knew how to write black people and their struggles. Obviously you’re in for a rude surprise if you go into one of these movies expecting incisive social commentary, but you also shouldn’t be subjected to 40 minutes of forced, unconvincing melodrama as setup for another 40 minutes of forced, unconvincing melodrama. This movie takes so long to get going, all in the name of “character development” and an irritating need to explain its own place in the franchise. One of the main appeals of this franchise is simply the existence of the Purge as a nationwide event that people gladly participate in. I don’t care about a prequel. I don’t want them to go behind the premise. I want them to expand on the premise and take it to intriguing new places. This almost feels like a reversion to the first movie’s way too limited scope, just this time including periodic scenes of Marisa Tomei forgetting how to act. No, we don’t always need subtlety. Especially with these topics, subtlety might be overrated. I’d just prefer unsubtle movies to not be this bad.